Ms. Cho received a B.Soc.Sc. in Journalism from Ewha Womans University (1997) and also took courses at the Intensive English Institute as well as attending communication lectures at the University of Illinois at Urbana-Champaign (1996). She obtained her Master of Laws degree (LL.M.) from Queen Mary, University of London (2015). While studying in the UK, she was honored to receive a prestigious Chevening scholarship from the UK government, and worked as a student legal advisor at qLegal of Queen Mary, University of London. 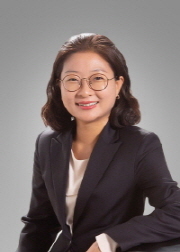 She was admitted to the Korean Patent Bar in 2001 and started her professional career at D.S. Mock Patent Office in 2001. Then, in 2003, she joined Y.P. Lee, Mock & Partners with the merger of the two firms, and became a partner in 2009. Ms. Cho represents a variety of global company clients, including luxury fashion houses as well as pharmaceutical and medical companies, and handles the full spectrum of trademark and design prosecution and contentious work before the KIPO (Korean Intellectual Property Office), the KIPT (Korean IP Tribunal), the Patent Court, and the Supreme Court. She also advises on licensing, as well as infringement, unfair competition act, and strategic settlement matters. She is a member of the INTA and the AIPPI, and regularly attends the PTMG (Pharmaceutical Trademark Group) conferences.